Here’s an expression that never caught on – DIDO – Drop In, Drop Out. But I still like it. As I like all the images in this. Such a collection. 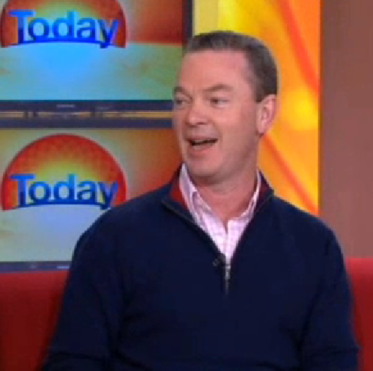 And cop the picture of Christopher Pyne in the K-Mart jumper. And I completely forgot about #KnittingSongs – remember hashtags? I do. There has been much written about the demise of Julia Gillard and the rise of Julia Gillard. Much of it excellent, such as this post by Kelly Exeter, or this excellent summation by Katharine Murphy as to how Gillard lacked the “essential alchemy” it took to become a successful PM. For me, it can be summed up as the difference between an enabler who needed good spinning and an spinner who needs others to enable, as well as the need to appeal to more than just the “true believers” who liked and supported Gillard. It also shows the gap between people who connect deeply with Twitter on political issues and the DIDO consumers of social and other forms of media – those that Dip In and Dip Out. When I started blogging, I hooked into the idea of Gillard being an enabler in terms of political deals and legislation, which never went away for me. Compromises, deals, negotiations – the metaphorical “back room” was where Gillard was clearly in her element – the number of bills passed can be used as testament of the success of Gillard as the head of a government that knew how to formulate and pass legislation. Problem was as a salesperson of the policies, the perception of Gillard was dreadful from Day One. The “backstabber” became the “robotic” became the “real / not real” became the “liar” became a mess. 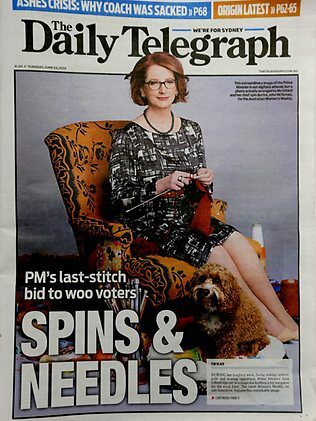 And positioning Gillard as the knitter of spun wool wasn’t the smartest move either. The hashtag I created as a result of boredom on a train trip – #knittingsongs – took off to an extent I could never have predicted – even 2Day FM enthusiastically promoted it. It may not be logical, sensible or rational. However, it is a palpable element in society. Sometimes the way of promoting people goes beyond learned and carefully mapped out ways of promoting people. Oftentimes, it comes down to a mixture of good luck and instinct. And Gillard, in her time as PM, either had little instinct, or was drained of instinct by those around her. One of those around her, John McTernan, put the downfall of Gillard in the hands of the sexists of Australia, which sought to deflect blame to the fringe dwellers of the Australian media and public who revealed a deep seated sexism. What is left out is that the infamous “red box” and Sattler question were responded to swiftly in a unilateral sense of disgust, which revealed not sexism, but the ability for society to respond swiftly to such expressions of anachronistic attitudes. What was telling about McTernan’s piece was the neat way it summed up the approach of the Gillard supporting megaphones to defending Gillard, no matter what was actually happening. 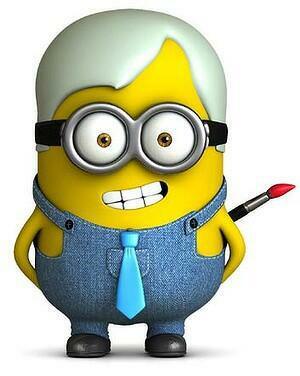 Kevin Rudd, however, doesn’t have an army out on Twitter to defend his record or image. Indeed, there were conspiracy theories a plenty about the media / Murdoch “installing” Rudd and the like. However, support amongst Twitter wonks who are deeply engaged in political analysis and comment is not as important to Rudd as support in the DIDO social media world. 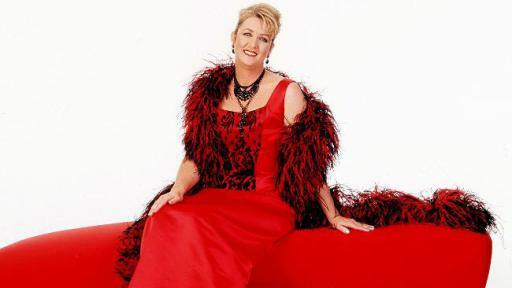 The DIDO social media consumers are people who follow celebrities (and therefore, Kevin Rudd, who seems to transcend to that sphere), check Facebook, watch Sunrise, The Project, or read the high profile lifestyle blogs. 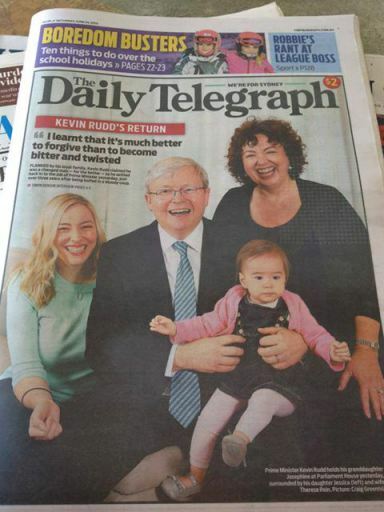 Rudd comes across better to them than Gillard could ever achieve. For evidence of how his style plays out, here is Kevin in Macquarie, a seat that the ALP may even win back from the Liberals in this Ruddsurrection world. What Kevin has is the instinct and the image that strikes a chord with the population. 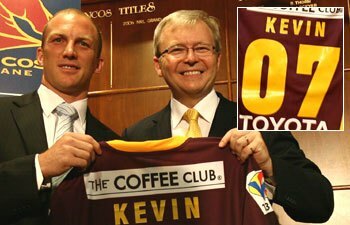 The Kevin 07 campaign, as hokey and awkward as it may appear to political wonks, worked to make Kevin a marketable brand. He was a Howard-lite, a safe pair of hands with a sharp intellect who would protect workers’ rights. And, in terms of our family centric media outlets, a family that can be trotted out. Still vivid in my memory are the billboards next to the Hume Highway heading through Werriwa and towards Macarthur, with Kevin looking serious and slightly aloof, promising the widening of the road. Simple messaging was the key. Importantly, in addition, he was from Queensland and had the image of being a supporter of Northern States sports – including rugby league and rugby union – a factor that can’t be discounted. 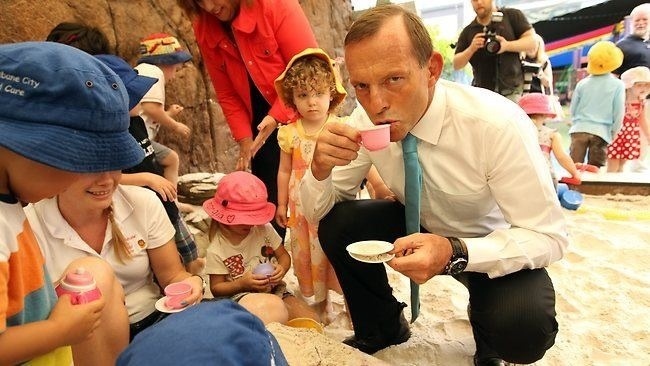 Even a satirical image like this excellent one from the Sydney Morning Herald shows us that he is easy to satirise, but that it can make him more endearing a figure. Julia Gillard was working against not only the Liberal Party, she was working against Kevin. And she was, no matter how good a negotiator or enabler, never going to win that battle. I do think, however, that Julia Gillard has shown that she will be a formidable and positive force in whatever field she chooses to enter after the election – and will become one of our finest ex PMs. It’s not a reflection on her as a person that she didn’t have the alchemy that people like Rudd – and, I would argue, Turnbull – have. In the case of the latter, it may well count against Abbott that he appears scared of engaging even with DIDO media consumers by appearing on Today and Sunrise, leaving it to people like Joe Hockey, and oddly, Christopher Pyne (somehow, I can’t picture Pyne going to Kmart to buy this jumper – I can imagine the spin doctors telling to put away his usual gear). As if by magic, however, Abbott appeared today on Sunrise, trying to engage with the DIDOs and ending up being made to look robotic and stumbling by an excellent carbon pricing question by Andrew O’Keeffe. One day, the Liberal strategists may just realise that Turnbull will appeal better to these DIDO consumers. Or maybe they really want a more compliant and easily manipulated PM in the chair than Turnbull would prove to be.